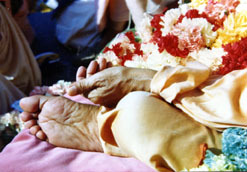 (1) 0 Vaisnava Gosvami, please be merciful to me now. There is no one except you who can purify the fallen souls. (2) Where does anyone find such a merciful personality by whose mere audience all sins go far away? (3) After bathing in the waters of the sacred Ganges many times, one becomes purified, but just by the sight of you, the fallen souls are purified. This is your great power. (4) The holy name delivers one who has committed an offense to Lord Hari, but if one commits an offense to you, there is no means of deliverance. (5) Your heart is always the resting place of Lord Govinda, and Lord Govinda says, "The Vaisnavas are in My heart." (6) I desire the dust of your holy feet in every birth I may take. Please consider Narottama yours, and be kind upon him.